Fatsia japonica-false castor bean plant-Also called the Fig Leafed palm or Japanese Aralia. This upright evergreen shrub is much loved for large waxy cut leaves. Looks exactly like a Castor bean plant but does not bear poisonous seeds like a Castor bean. If you have children or pets it is better to grow Fatsia japonica than risk having highly poisonous seeds on your property! Apart from its jungle like exotic form, Fatsia also produces white waxy blooms in autumn. An excellent specimen for shady town gardens, in a container or in a bed. 2m tall x 3m. 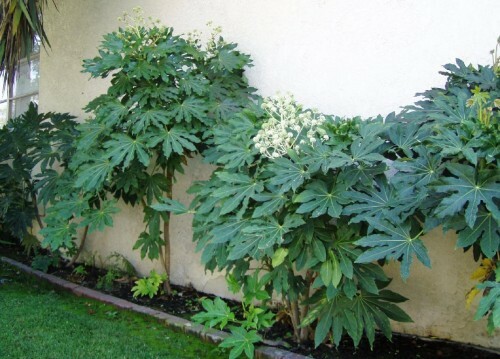 Fatsia japonica cultivation notes: Preferring a sheltered location away from cold winds and heavy frosts; Fatsia will flourish in sun or shade. Prune out damaged / dead wood in spring - trim to shape, but avoid over pruning.